Beautiful 4400 SF home, 5 bed, 4 bath, 3 car attached garage & addl. 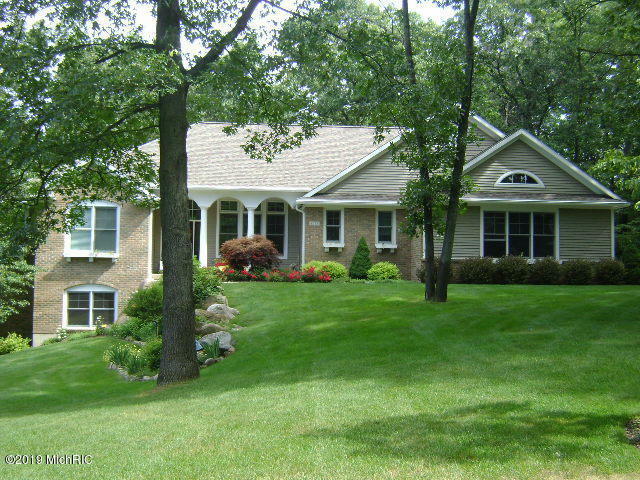 3 car detached garage all on a wooded 2.3 acre lot. Hardwood floors, 10' ceilings, large living room with huge windows overlooking a private back yard and cozy dual fireplace; gourmet kitchen with island, pantry and dining area. Master suite with jet tub and walk-in closet; office or bedroom, full bath, and large laundry room. Relax in the 4 season sun room or wander to the walkout level for a movie night, games, or chill at the wet bar. Lower level has family/rec room, dual fireplace, 3 large bedrooms, 2 baths, workout room, and plenty of storage space including a room for lawn equipment, workshop etc. with double doors to the back yard. Extras include zoned heating, heated floors in lower level & in the attached garage.